Scientists have a limitless hunger for computing power and storage. That’s why three European agencies — CERN, the force behind the Large Hadron Collider; the European Molecular Biology Laboratory; and the European Space Agency — are cooking up a European science cloud to handle their compute-intensive workloads. The Helix Nebula Science Cloud aims to bring enough firepower to solve very hard problems and deal with tons of data churned out by the second. As an example of the size of the task, CERN alone stores about 15 petabytes of data per year, uses 150,000 CPUs continuously, and writes data at 6 GB per second. “Physicists can consume as much compute power and storage as we can give them. There is so much data and so many ways to explore and mine that data, that we’re always looking for new techniques to increase that total capacity,” said Bob Jones, the head of CERN’s OpenLab in an interview. CERN, or the European Lab for Particle Physics, is based in Geneva and funded by European Union nations. The project is backed by commercial partners including Atos, Capgemini, CloudSigma, Logica, Orange Business Systems, SAP(s sap), Telefonica, the Cloud Security Alliance and the OpenNebula project. Up until now CERN has been using publicly owned infrastructure — 150 data centers in all — that contribute resources for LHD data. “We want to see if we can use commercial infrastructure as an additional resource,” Jones said. Like any organization, the group is trying to build in flexibility and maximize price performance. Discussion around the project started last summer, and the group decided to use the new infrastructure initially for three projects. 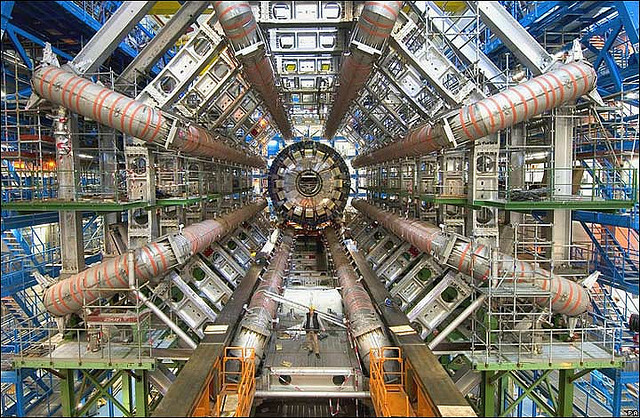 CERN will use the infrastructure to handle the Atlas Experiment, a particle physics project, at LHC. The European Molecular Biology Lab will use it in a new project to simplify the analysis of large genomes and the European Space Agency, working with two partners, will build an application to study earthquakes and volcanoes. The first stage of the project is a two-year pilot building a cloud to handle those three applications. There has been a movement to build Europe-only clouds, with proponents usually invoking the U.S. Patriot Act as rationale. Because some European nations –notably Germany — have tougher privacy laws than those in the U.S., local companies want to make sure data in their data centers cannot be turned over to U.S. authorities. As the prototyping continues, Jones said the group will look into bringing other research organizations and cloud providers aboard.